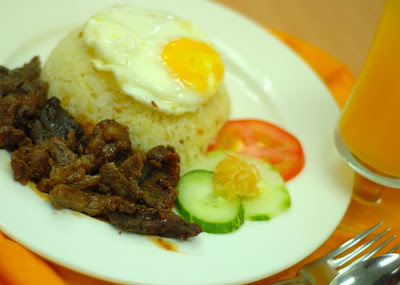 Tapa is a meat viand typically made from thinly-sliced beef (tapang baka), and served with rice and egg in the much-loved tapsilog. It is marinated with a mildly sweet sauce, suited to the Pinoy palate, and is a favorite in eateries all over the country. Tapsilog composed of Tapa(beef),sinangag(Fried rice) and Itlog(Fried egg). Filipinos never tire of tapsilog, Plus, by preparing this from your home, you guarantee freshness and top-quality ingredients compared to the store varieties. This viand can come in several ways — as lunch boxes, sandwiches, frozen bulk purchases, etc. — so you have a number of business options. Use the meat pounder to tenderize and thin out the meat. Place the meat into the stainless steel bowl, together with salt, pepper, sugar, chopped garlic, MSG, white vinegar, and 3 to 4 tbsp of soy sauce. Mix well. Transfer everything to a plastic container, and let meat marinate for about 12 hours in the refrigerator. Remove and mix again. You can opt to repack and freeze the meat for a later date. When the meat is ready to be served, fry in a hot pan, using vegetable oil. Tapa is usually eaten together with fried rice and egg.